Players also receive points for the longest part of wall they have built around their Alhambra. More points are awarded in each scoring round. The winner is the player who has been awarded the most points by the end of the game. Each player is given a starting tile, which they place on the table in front of them, and 2 counters in the colour of their choice. One counter is placed on the starting tile and the other in the bottom left corner of the scoring board. The 54 building tiles are put in the bag ready for the start of play. Put the building market in the middle of the table and the scoring board at the end of the table. Four building tiles are taken at random from the bag and placed in order on the four numbered squares of the building market, beginning with square 1. Each player is given a tile reserve board with a points table which he puts in full view in front of him. 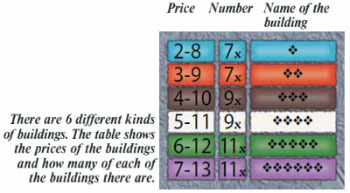 The points table shows how many there are of each kind of building tile and how many points can be won with them. The two scoring cards are taken from the pack of money cards and put to one side for the time being: the rest of the pack is shuffled. Each player is now given their starting money. To do this one card at a time is taken from the money pile and placed face-up in front of a player until the total is 20 or more (the currency is not important at this stage). The next player is then given their money. When all the players have been given their money, they pick up their cards. From now on each player's money is kept secret. The player with the fewest cards starts; if two or more players are equal the player with the lowest amount of money starts. If the players are still equal the youngest starts. Finally, 4 more money cards are laid face-up in the middle of the table next to the building market. The rest of the money cards are divided into five roughly equal piles. Put the "1st Scoring Round" card into the second pile and the "2nd Scoring Round" card into the fourth. Then put the piles on top on one another again with the fifth pile on the bottom, then the fourth, the third, the second and finally the first at the very top. The whole pile is then placed face-down next to the building market. Play proceeds in a clockwise direction, beginning with the starting player. After a player's turn is over any money cards and building tiles which have been removed are replaced with new ones so that there are always 4 of each. 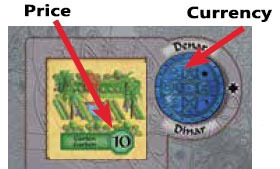 A player can take any one of the money cards from those lying face-up, or several money cards if they do not add up to more than 5 (the currency does not matter). A player can buy a building tile from the building market. He must pay at least the price shown on the tile and use the currency displayed next to the tile in the building market. But take care - no change is given! The money used to pay for the tile is placed on a discard pile next to the building market. If you can pay the exact amount it is still your turn and you can decide once more which of the three options you would like to take. While it is your turn no new tiles are placed on the building market. It is only at the end of your turn that the empty squares are refilled with new tiles. 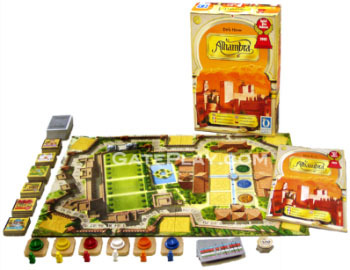 It is therefore possible to carry out a maximum of 5 actions during your turn (paying the exact amount four times and then either taking money or redesigning your Alhambra). You can either: add your new building tile to your Alhambra or place it on your reserve board. You can have as many building tiles on your reserve board as you want. You can take a building tile from your reserve board and add it to your Alhambra. You can remove a building tile from your Alhambra and put it on your reserve board. You can exchange a building tile on your reserve board for one in your Alhambra. If you do this the new building tile in your Alhambra must go in exactly the same place as the one you remove. When you are redesigning your Alhambra you must still follow the building rules. You are not allowed to remove the starting tile or exchange it for another tile. All building tiles must be the same way round as your starting tile (i.e. all roofs must point upwards). Adjoining sides must be the same i.e. they must either both have a wall or both not have a wall. You must be able to reach each new building tile "on foot" from the starting tile without crossing a wall and without going off the tiles. 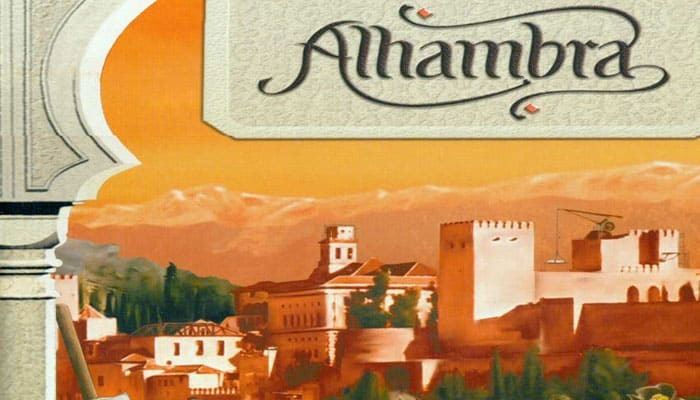 Each new tile must be joined to your Alhambra by at least one side (i.e. it cannot be joined just at a corner). You must not leave any "spaces" (i.e. an empty area surrounded on all sides by building tiles). It is only right at the end of your turn - i.e. 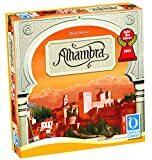 after any redesigning you may have carried out - that you add the building tiles you have bought to your Alhambra or place them on your reserve board. You can add the newly bought building tiles in any order you wish. When your turn is over it is the next player's turn. Before the next player decides what to do, any money cards or building tiles which have been removed are replaced with new ones so that there are four of each again. If you reach the end of the money cards the discarded money is shuffled and placed face-down to make a new pile. There are 3 scoring rounds during the game. The first two take place when the scoring cards are drawn from the pile of money cards. The third and final scoring round takes place at the end of the game. When a scoring card is drawn it is put to one side (withdrawn from the game) and the next card or cards are used to make the number of money cards up to four. But before the next player starts his turn the scores are calculated. In each scoring round, points are awarded to whoever has the most of each kind of building. 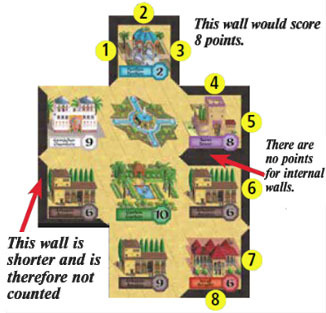 Players are also given points for the length of the wall around their Alhambras. Points for having the most of each kind of building Points are awarded for having the highest number of one of the different kinds of buildings. The number of points a player receives depends on which kind of building it is. 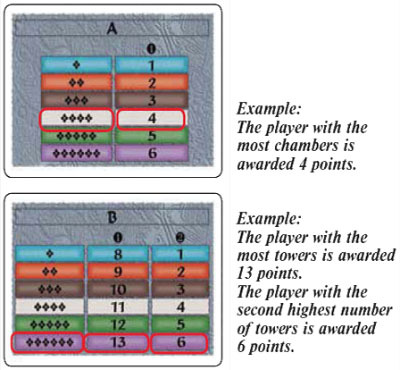 In each case, the player with the most buildings is awarded the points for 1st place indicated on the scoring card next to the name of the building. Only the players with the most buildings of each kind receive points when the "1st Scoring Round" card is drawn. Points are awarded in the later rounds as follows: in the "2nd Scoring Round" (which takes place when the "2nd Scoring Round" card is drawn), points are awarded to the players with the highest number and second highest number of building tiles of each kind. If several players tie, the points for the respective places are shared. Points are always rounded down. The 3rd round of scoring takes place at the end of the game; points are then also awarded to the players with the third highest number of buildings of each kind as shown in the example and on the points table on the tile reserve board. Take care: building tiles on the reserve boards are NOT counted towards players' scores. As well as points for buildings, players are also awarded points for the longest joined wall around their Alhambras. Each side of a tile with a wall segment on it counts for 1 point. No points are awarded for walls which are back-to-back, i.e. internal walls. The points awarded to a player are recorded on the scoring board. Each player moves their counter one space forward for each point that they have been awarded. The game ends when - at the end of a player's turn - there are not enough building tiles left in the bag to bring the total up to four again. 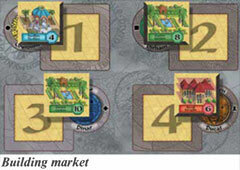 The remaining building tiles from the building market are given to the players who have the most money of the respective currency in their hand (it does not matter how much the building costs). If two or more players have the same amount of money then that building tile remains on the building market. 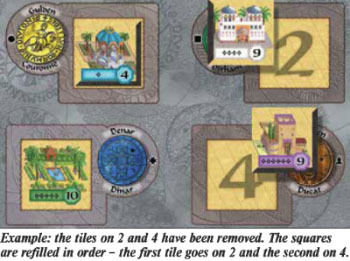 Building tiles given to players in this way may then be added to their Alhambras in accordance with the building rules. The third and final scoring round now takes place. The player who leads on the scoring board after this last round has won. If two players are level the game is a draw.